This is the world's first and only physician authored book on this subject. It is based on over 6,000 procedures by the author since 1990 and has already been purchased by and has taught the procedure to over 500 eye surgeons worldwide. All needed forms, letters, permit, post-operative handout, and coding. 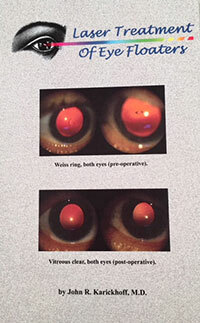 laser treatment of eye floaters is an off-label use of the YAG laser (see FDA and Floaters page).